One of the reasons I appreciate seasons is for the change in food. What we eat in the winter looks so dramatically different from what we eat in the summer. Winter is all about the comfort food, and currently, I’m on a soup kick. It’s frigid outside, and I want warm, delicious, creamy soup for dinner every night. Overkill? Maybe. Nonetheless, there’s something to be said for warming yourself from the inside out. This soup is anything but low-calorie, but it’s worth it! 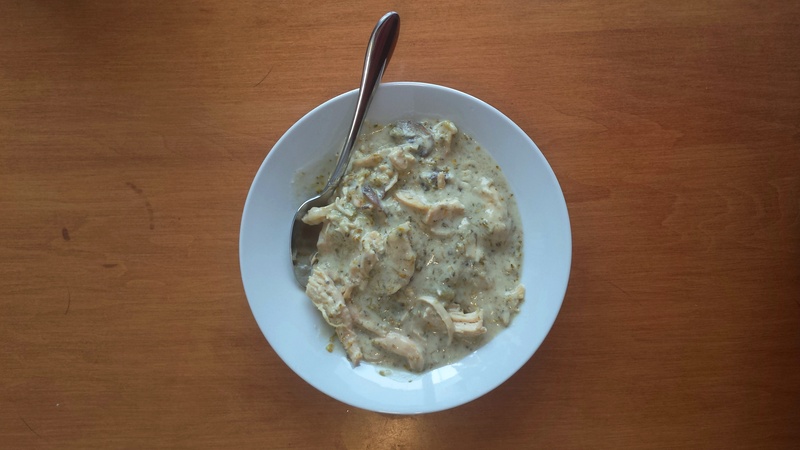 Broccoli, mushrooms, cream, and chicken–need I say more? 1. Melt butter in large stock pot or dutch oven. Add broccoli, onion, mushrooms, garlic, salt and pepper, and basil. Saute for 5 minutes. 2. Add chicken broth, half and half, and 1 cup of milk. Bring to a boil. 3. In a measuring cup, mix 1/2 cup milk and 1/4 cup flour until there are no lumps. While stirring, pour into soup. Mix for 1 minute. 4. Add chicken breasts, and reduce to a simmer. Once chicken breasts are cooked through (10-15 minutes), remove and shred. 5. Add shredded chicken and Parmesan cheese to soup. Simmer for 5 more minutes. P.S. I’m on blog lovin’ now! Join me? True confession: I’ve been falling into a cooking rut lately. I rarely try new recipes, and that makes life dull and cooking more of a chore, less of a fun adventure. That’s going to change this winter! 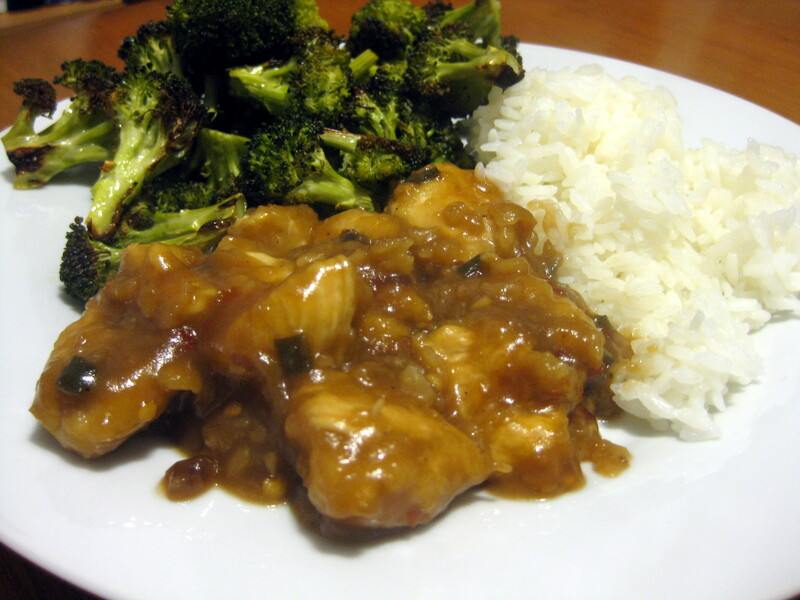 Meal one: orange chicken. It was delicious and full of flavor. It takes awhile, so make it sometime when you have a good hour to devote to the kitchen. Prepare 1 cup of your preferred rice according to the directions on the packaging. 1. Make your sauce! Add everything but the cornstarch and the 1 Tbs of water to a sauce pan. Mix, bring to a boil, and remove from heat to cool. 2. While it’s cooling, rip your chicken. Really. Tear it. Don’t cut it with a knife. Put it in a large ziploc bag, pour 1 cup of the sauce in, and allow the chicken to marinate at least 30 minutes, but up to a full day. 3. In another ziploc bag, mix the flour, salt, and pepper. Once the chicken is done marinating, put the chicken pieces in the bag with the flour mixture, and toss to coat. 4. Heat 3 Tbs. olive oil in a large skillet. 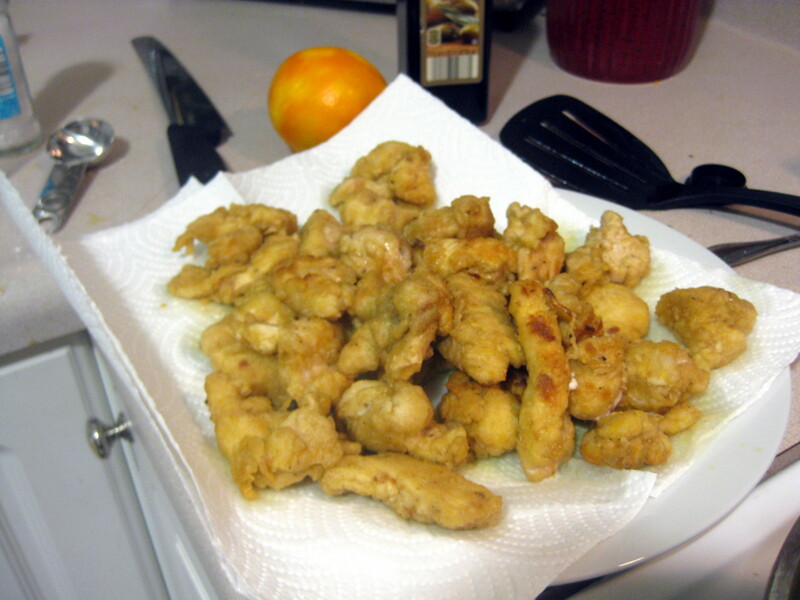 Add the chicken pieces in batches, so they aren’t too crowded or stacked on top of each other. Brown each side, and remove to a paper towel lined plate. 5. 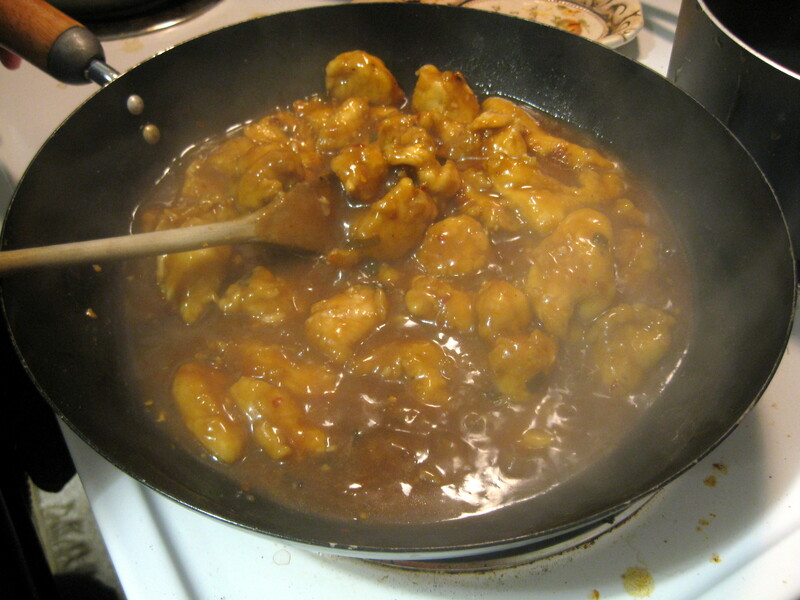 Once all the chicken is done, add the remaining sauce to the skillet, bring to boil. Whisk the cornstarch and water together in a cup, and pour it in the sauce. Reduce heat to medium low, and add chicken to the skillet. Cook for 5-10 more minutes. I love pasta. It is the ultimate comfort food. It’s “curl up on the couch in your sweat pants and watch a good movie” food. It’s “invite the people you love, and serve a big pot of happiness” food. True fact: nothing says, “I love you,” like pasta and cheese. 1. Get your chicken cooking. We did ours on our George Foreman grill, and it worked pretty well. You could also bake it in the oven or pan fry it in a skillet. 2. Prepare the pasta according to the directions on the box. 3. To make the sauce, melt butter in a sauce pan over medium heat. Add cream, and simmer for 5 minutes. Add garlic powder, stir. Mix in Parmesan cheese–keep mixing until there are no more lumps. Keep pan on low heat until ready to serve. Sauce is based on this recipe. 4. When pasta is done, plate each serving. 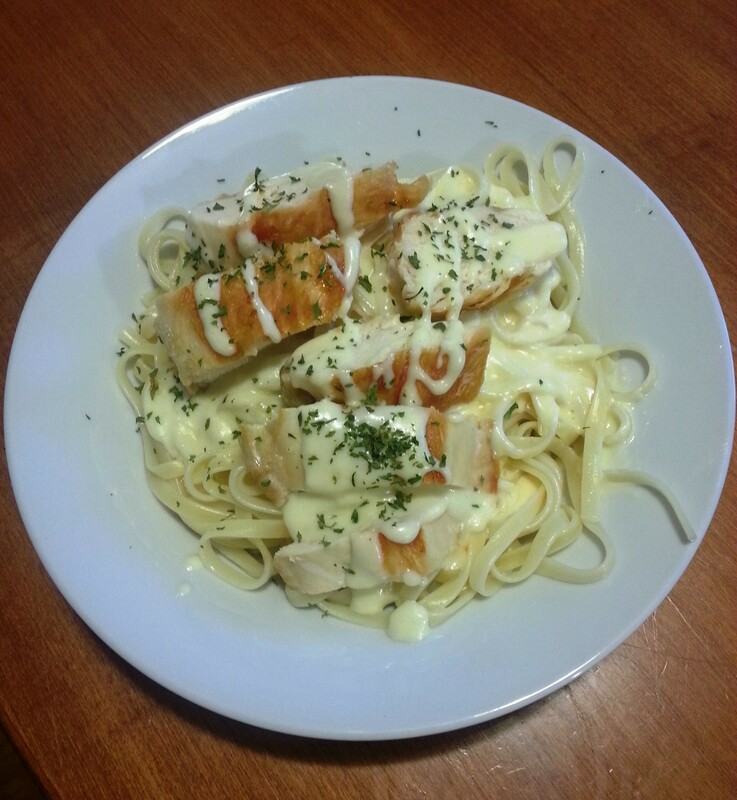 Slice the chicken breasts, and layer over pasta. Drizzle with sauce, and sprinkle parsley on top. Double or triple as needed. Enjoy!